Here's Popeye's favorite, served up Italian style! 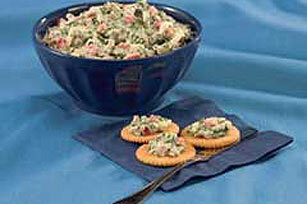 This yummy spinach spread gets its creamy and cheesy from sour cream and mozzarella. Mix sour cream and dressing mix in medium bowl until well blended. Add spinach, cheese and red pepper; mix well. Cover. Refrigerate several hours or until chilled. Serve as a spread on crackers. Spread each RITZ Cracker with spinach spread in circular pattern to resemble a wreath. Decorate with additional roasted red pepper pieces to resemble bows.